It provides an output of 12-volts - at a current of up to 1-amp. In the event of a mains failure - the back-up battery takes over immediately. And when mains power is restored - the battery recharges automatically. The 7805 needs the larger heatsink because it has to dissipate a lot of energy - especially when called upon to recharge a flat battery. Its heatsink is at 9v1 - and must NOT be connected to ground. The 7812 never has to dissipate more than 2-watts - so its heatsink can be smaller. 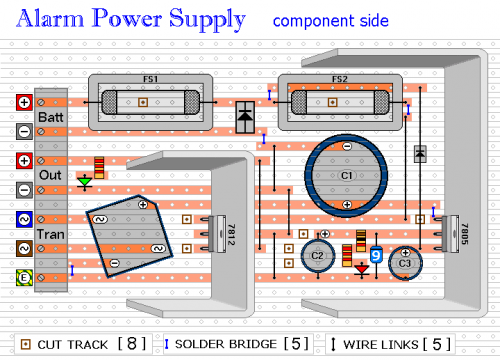 Many of the components, which are shown lying flat on the board, are actually mounted standing upright. 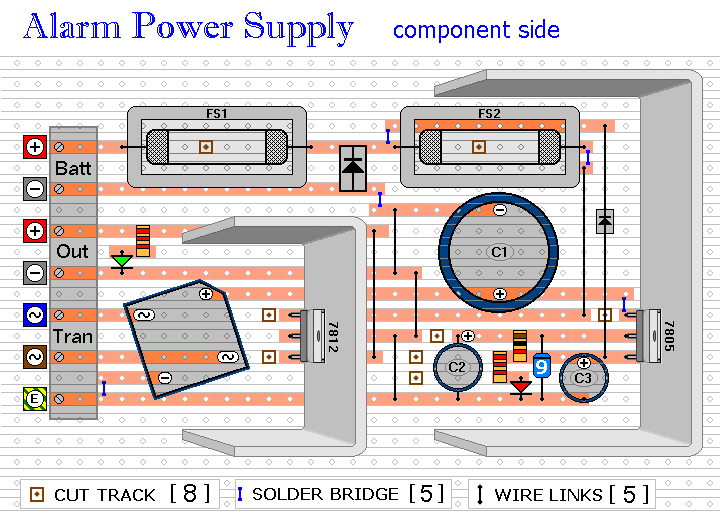 The links are bare copper wire on the component side of the board. The heatsinks are folded strips of aluminium, about 2mm thick. Use a well-insulated panel mounted fuse holder for the mains supply to the transformer - and fit it with a 1-amp fuse. 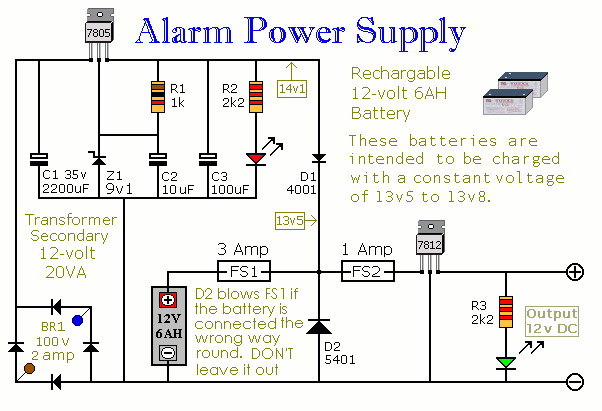 Use a genuine alarm type back-up battery. They are maintenance-free. Their terminals can be held at 13v8 for many years - with no apparent ill effects. They have a life expectancy of about five years. However, they tend not to recover from a very deep discharge. If you wish - you can use a smaller or larger capacity battery.